The Xbox One S offers a sleek, compact, and 4K video-capable alternative to the original Xbox One, which has been discontinued, and with multiple bundles sporting a variety of storage capacities and packed-in games, the Xbox One S is a great option for anyone looking to pick up an Xbox system for the first time. With bundles available at about $300 for the 1TB version and one game, it’s also one of the most affordable consoles on the market today. Should you opt for the slick One S, or stick with your tried-and-true Xbox One? Well, considering that the native 4K-capable, ultra-powerful Xbox One X console launched in 2017, the answer to that question really depends on your pocket depth and your eagerness to adopt the latest-and-greatest tech. Below, we take a look at the Xbox One vs. Xbox One S.
The Xbox One S supports 4K video playback from streaming services such as Netflix, Amazon, and several others. The console also features a built-in 4K Ultra HD Blu-ray. At around $300, the Xbox One S is a relative steal when compared to the price tag of some of dedicated UHD players currently on the market, which makes it a solid purchase for individuals who currently own a 4K TV. The last-gen Xbox One accepts regular Blu-ray discs, but it can’t handle UHD Blu-ray or 4K streaming. While both the Xbox One and Xbox One S play games natively at 1080p, the Xbox One S can upscale games to 4K resolution if you have a 4K TV. That makes for a better picture than 1080p or 720p, although it’s not as good as native 4K. The Xbox One S also has the ability to play games at 1440p resolution, thanks to an update in April 2018. The Xbox One S also supports HDR, or High Dynamic Range, which greatly broadens the range of displayed colors and contrast. Deeper colors and richer contrast means more vibrant and realistic imagery. The original Xbox One does not support HDR for games or video playback. The HDR upgrade makes for a vivid in-game experience, but you must have an HDR-capable TV. That being said, a large number of games have been adding the feature, particularly first-party Microsoft releases. Games like Assassin’s Creed Odyssey, Forza Horizon 4, Shadow of the Tomb Raider, and Call of Duty: Black Ops 4 all support HDR. The Xbox One S is an aesthetic marvel when compared to the aging look of the Xbox One. 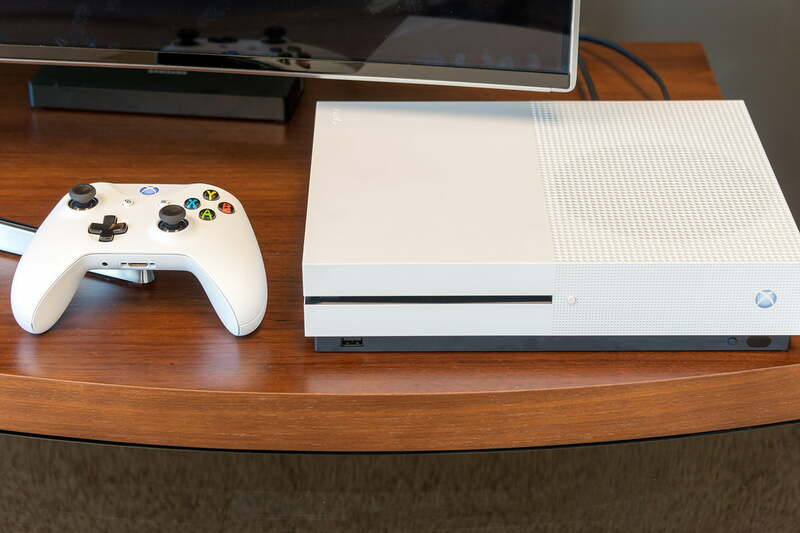 Opposed to the uninspiring, cinder-block design of the Xbox One, the Xbox One S features a matte-white block on a raised black base. The Xbox One S is also capable of being positioned upright, with an upright stand accessory available for $20. The original, on the other hand, can only be positioned horizontally. The Xbox One S is smaller than the Xbox One, yet still manages to house the power brick that was once an outside component of the Xbox One. As anyone who has ever owned an Xbox One knows, the touch-sensitive power button can be temperamental. Similarly, the controller sync button was inconveniently located. The Xbox One S addresses many of these design flaws. 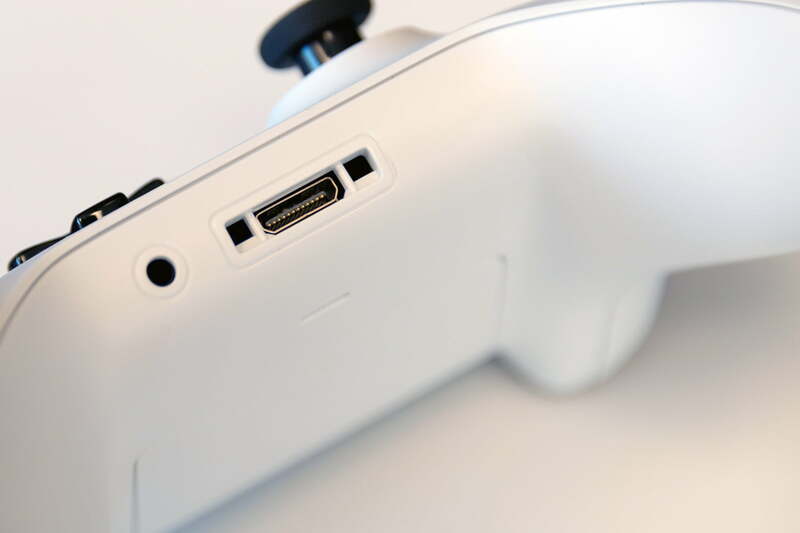 The front of the Xbox One S features a physical power button, controller sync button, a disc eject button, and a single USB 3.0 port. The back side of the Xbox One S has two HDMI ports (one in, one out), two more USB 3.0 ports, S/PDIF, and Ethernet. Both models offer an IR blaster, as well. The Xbox One S dropped the dedicated port for the Kinect. Only a handful of games utilized Kinect to begin with, making the move fairly irrelevant from a gaming standpoint. It is still possible to use the motion-sensing device with the Xbox One S using a now-discontinued adapter, though you may be having trouble finding one. However, since Kinect users will have to use one of the USB ports for the adapter, they’ll be down to only two USB ports, and the additional adapter requires its own power supply, unlike with the original Xbox One. The Kinect port has been replaced with an integrated infrared blaster on the Xbox One S, allowing users to configure their Xbox One S to control devices such as their TV and A/V receiver. After several postponements, the Xbox One and One S both added support for Microsoft’s digital assistant, Cortana. The assistant — first introduced on desktop machines with Windows 10 — is aimed at carrying out an array of standard tasks, and thus allows you to look up the weather, search the internet, open apps, and perform a host of other actions. At the moment, Cortana is wildly insufficient for more than the most basic functions, though the feature will likely get better as time goes on. As with any platform, trial and error is key to a harmonious relationship. Both the Xbox One and Xbox One S can use Cortana and Kinect. An recent update even lets you use Amazon Alexa on your Xbox One, as well. The folks at Microsoft continue to further distance themselves from the Kinect, and as such, the latest Xbox controller comes with a jack that allows you to communicate with your digital assistant via a headset. From a tactile, gaming perspective, the controller still very much feels like the controller we’ve all grown accustomed to, albeit with a new textured grip and an assortment of covers. The controller also comes equipped with Bluetooth, which extends its range and makes wireless gaming with Xbox Anywhere titles far easier. The Xbox One S supports all the games you loved on Xbox One and vice versa. It’s also possible for the Xbox One S to upscale older games to 4K (note that it doesn’t render at that resolution — it only upscales). Regardless, unless Xbox One owners are really chomping at the bit for increased support and video quality, there’s no dire need to upgrade at the moment. Similarly, both consoles support backward compatibility for select titles, including those in the Xbox Game Pass subscription program. As previously mentioned, the original Xbox One has been discontinued by Microsoft. That means if you want one, you have to buy it from third-party sellers on Amazon or a resale site like eBay or Craigslist. You can find an official refurbished Special Edition for around $200. The Xbox One S is available in several different bundles, both from Microsoft and otherwise. From the official Microsoft store, you can find $300 bundles with a 1TB Xbox One S and a select game. You can also find a 500GB Xbox One S, without a bundled game, for $250. To upgrade or not to upgrade? The Xbox One S is without a doubt one of the best Ultra HD Blu-ray players on the market for the price. Coupled with the general gaming upgrades, the Xbox One S is a great option for individuals looking for a worthy Ultra HD Blu-ray player, as well as individuals purchasing their first Xbox. Though our initial review for the original Xbox One actually gave it a higher score than the Xbox One S due to the platform’s potential, the Xbox One S is the superior machine. With the original Xbox One discontinued, the real question about which machine to get comes down to price. If you really want to max out your gaming potential, you’ll probably want to spring for an Xbox One X with 4K gaming. For those looking for a thriftier option, though, the Xbox One S is now cheap enough with game bundles that it’s highly affordable, and a solid, if middling, upgrade over the original Xbox One.